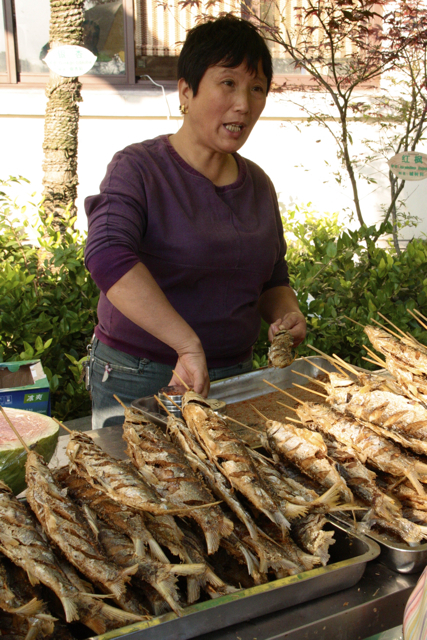 Life on Nanchang Lu: Fish on a Stick! The best street snack in Qian Dao Hu is the local lake fish, gently salted and spiced, and grilled on a stick to make it easy to eat. No mess, just spit out the bones as you go. 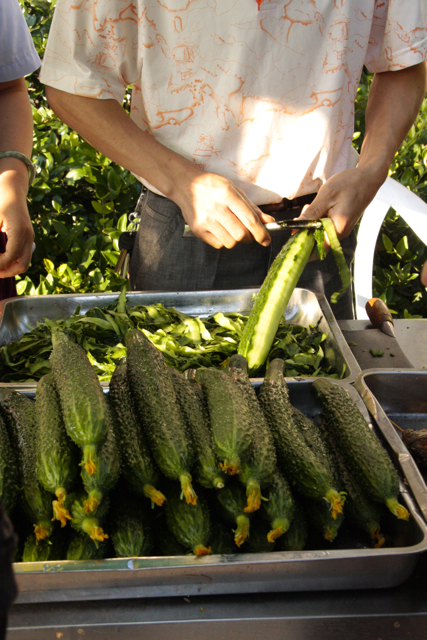 The perfect side dish for fish on a stick is a peeled, hand-held cucumber. The bristly bumps are peeled off to order, and you simply hold it by the unpeeled skinny end, like a giant cucumber popsicle. Fish in one hand, cucumber in the other, bite them in alternating fashion for the perfect lake-side fast food lunch. After buying this fantastic snack, we inadvertently attracted a crowd. Again. Staring intently, the locals could see that in fact, weiguoren (foreigners) eat fish and cucumbers exactly the same way that they do. Only we're not very good at spitting out the little bones without getting them stuck on our chins.